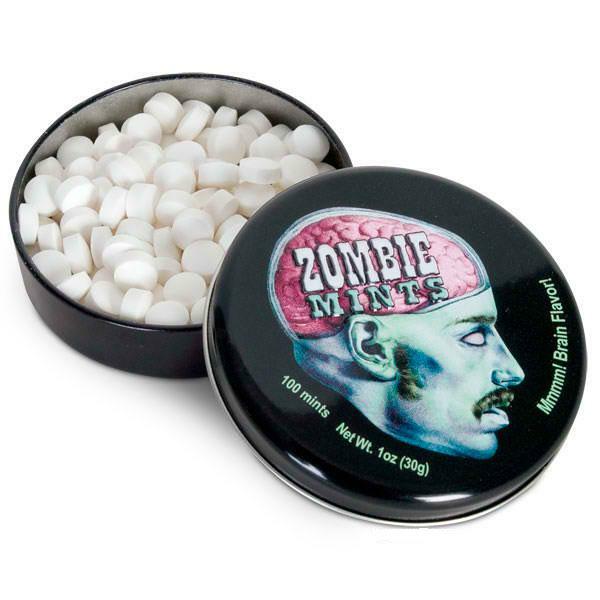 Next time you find yourself cornered by a mob of zombies intent on eating your brain, break out this tin of brain flavored Zombie Mints and offer it to the undead hordes. If you're lucky, they'll form an orderly, single file line and each take a mint before trudging away satisfied. If you're unlucky, they'll slap the tin away and feast on your cerebellum. This breath mint is guaranteed to make your mouth autopsy fresh and is quite possibly the strangest candy ever made! Each 2-1/4" round tin contains one hundred mints.